There is good news here y'all, I just so happened to make a batch of watermelon margaritas...a little sunshine on a rainy day in my book. These cocktails should be the official drink of the summer. They are the perfect balance of refreshing, tangy, and sweet with a kick from tequila, which is never a bad thing! 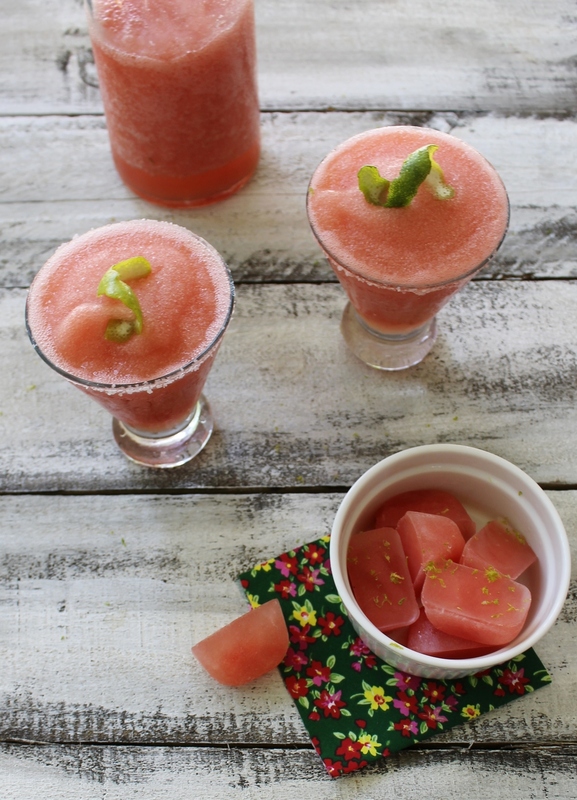 It's perfect for that extra watermelon that you have cut up in the fridge, or if you happen to get a watermelon that isn't perfect when you cut it open, throw it in the blender! This drink doesn't discriminate against imperfections! A drink to trick you into thinking you are on vacation...a sip of sunny rays! Or if you are somewhere sunny and gorgeous this weekend, I'm jealous, but nevertheless this drink would be perfect poolside or with your toes in the sand!